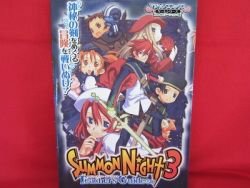 Title :SUMMON NIGHT 3 teacher's guide book /Playstation 2, PS2 Language : Japanese. This is an official book. Release Date : 2003 Total Pages : 161 pages Platform: Playstation 2, PS2 Condition : USED. Very Good. No missing page. Description:This is a Japanese Videogame "SUMMON NIGHT 3" Strategy Guide Book. If you love this Videogame don't miss it!